Adrian High is a PhD student at Duke University whose research is fuelled by a fascination with ancient documentary evidence. He explored the multilingual epigraphic record from second and third century Histria on the Black Sea through the prism of sociolinguistic theory as part of his Mag.Phil. at the University of Vienna. 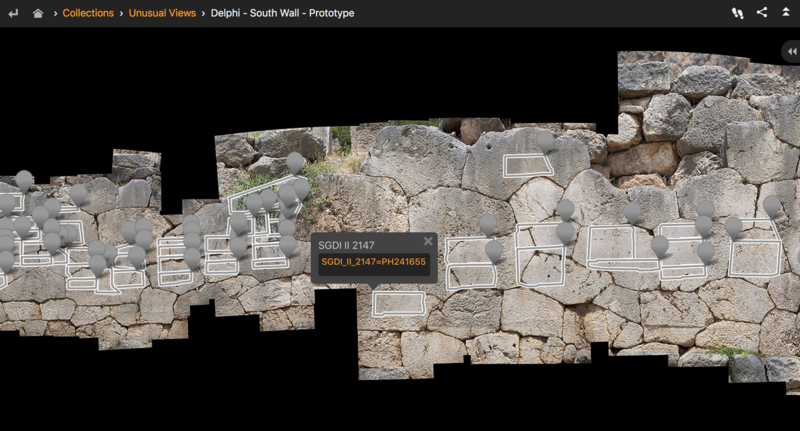 This blog is about the East Wall at Delphi text inscriptions and translation. He is now pursuing his journey into the tantalizing world of papyrology and epigraphy. His current digital project focuses on the archive of manumission inscriptions preserved on the Polygonal Wall in Delphi. For the moment, the objective is to make as much of the wall available online as a deep-zoomable visualization. Further steps include mapping all of the inscriptions on the wall and linking them to PHI (Searchable Greek Inscriptions). When you look at the inscriptions, they are weather-worn, hard to read and Adrian has used the GIGAmacro Viewer in a really smart way to mitigate these problems. When you look at the image in the GIGAmacro Viewer and click the (orange) text in the Note, a link is opened to the text on a different website with the full text of the carvings. This is a boon for those who study the texts, to be able to study the text clearly whilst seeing the context of the original work. Other views are here, here and here. I haven’t the faintest idea what any of the words mean, but I’m very impressed by the application of our GIGAmacro Viewer in ways we hadn’t even imagined. Please share on your social media (links below).